Ryan (AB ’10, JD ’13) and Kiel (BSED ’10, MED ’12) Scates give to UGA to promote autism awareness and treatment. As students, Ryan (AB ’10, JD ’13) and Kiel (BSED ’10, MED ’12) Scates started AutismUGA. The student-led organization helps families affected by autism in Northeast Georgia. The Scates continue to support their cause by giving to UGA’s ABA clinic, which provides clinical treatment for individuals with autism. They also are passionate supporters of the School of Law. While students at the University of Georgia, Ryan and Kiel Scates started AutismUGA, the first collegiate autism philanthropy in the South. Today, the student-led organization continues to work toward its founders’ goal: to help families affected by autism in Northeast Georgia. 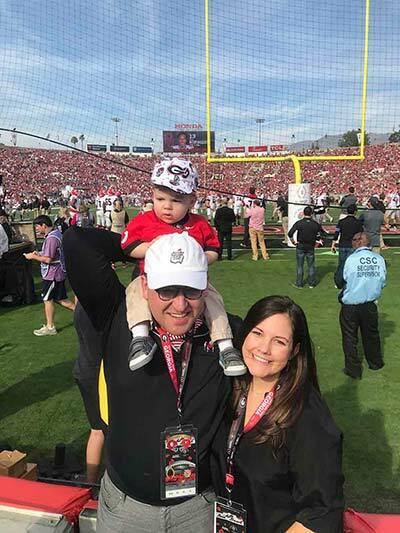 When the Scates started AutismUGA in 2008, many in the UGA community were unaware of the challenges faced by families with children with autism. Ryan and Kiel’s goals were to build awareness and raise funds so that local resources – like summer camps and support groups – could offer more assistance to families in need. Kiel pursued her bachelor’s and master’s degrees in special education from UGA. After graduation, she was certified in applied behavior analysis, a highly effective, evidence-based treatment method for individuals with autism. She now works as a Board Certified Behavior Analyst in Atlanta at Integrated Behavioral Solutions, Inc.
Today, the Scates continue to commit to their passion by giving to the Automatic for Autism Fund, which helps families utilize UGA’s Applied Behavior Analysis (ABA) Clinic. Due to the high cost of raising a child with autism, many families cannot afford the clinical support their children need. The Scates’ gifts provide greater access to treatment and allow students to train in applied behavior analysis. In 2010, Ryan and Kiel celebrated their engagement on UGA’s picturesque North Campus. Ryan and Kiel cheer on the Georgia Bulldogs with their son, Andy. Ryan and Kiel are also passionate supporters of UGA’s School of Law. Growing up, Ryan recognized that many of the people he admired most attended UGA for law school. He was determined to attend too. His law degree has resulted in a fulfilling career as a corporate attorney. His favorite aspect of the job is helping his clients solve challenging issues to ultimately reach their goals. Ryan and Kiel choose to give to the School of Law’s Atlanta Semester in Practice program. This program affords students the opportunity to garner real world experience while in school and develop a network of relationships in practice areas of interest—truly, a catalyst for an impactful legal career. Ryan also serves on UGA’s Metro Atlanta Young Alumni Leadership Council. As a member, he enjoys spending time with fellow Bulldogs and increasing awareness in Georgia’s capital of UGA’s work. “We want to let young alumni know that we need them to invest in UGA. UGA is only as strong as the people who went there. We want to remind everybody how great UGA is for our state and how instrumental it is in alumni’s lives,” said Ryan.